KC Piper 28, Jefferson West 24 – Piper rallied from down 24-7 in the fourth quarter to top Jefferson West for the second straight year. Tanner Eikenbary threw two of this three touchdown passes in the fourth quarter as the Pirates rallied. Piper took the lead on a Travon Jones touchdown run with just over two minutes remaining. Spring Hill 33, Ottawa 15 – Spring Hill avenged a 20-17 regular season loss to Ottawa by eliminating the Cyclones tonight. The Broncos built a 26-0 halftime lead and extended it to 33-0 in the third quarter. Spring Hill gets its first playoff win since 1990. Paola 24, Fort Scott 7 – Jeremy Criddle rushed for two first-half touchdowns totaling 117 yards as Paola built a 17-0 lead. Fort Scott pulled within 17-7 before ExZavier Miller capped the scoring with a 39-yard run late in the third quarter. Independence 33, Columbus 14 – Independence beat former SEK League rival Columbus 33-14 to advance to the second round for the first time since 2010. The Bulldogs scored 20 points in the fourth quarter to overtake the Titans. Courtlan Hayes rushed for a score and returned an interception for another touchdown to cap the scoring. Tonganoxie 52, Bishop Ward 6 – Tonganoxie blew out Bishop Ward for a second time this season. The Chieftains built a 46-6 halftime lead in moving on to the second round. Baldwin 19, St. James Academy 0 – Third-ranked Baldwin struggled through a 19-0 shutout of St. James Academy. The Bulldogs defeated the Thunder 56-18 earlier this season. Baldwin led just 7-0 at halftime but scored twice to defeat the Thunder in their first-ever playoff appearance. Chanute 28, Louisburg 14 – Chanute scored 28 consecutive points to overtake Louisburg 28-14. Louisburg led 7-0 at halftime and 14-13 entering the third quarter. Ethin VanAnne put the Blue Comets ahead with a 34-yard touchdown with six minutes remaining. Alex Son scored two touchdowns on the night. Coffeyville 47, Frontenac 12 – Coffeyville defeated Frontenac for the second consecutive season. The Golden Tornado led just 7-6 at halftime and 14-6 well into the third quarter. As they have all season, Coffeyville scored in bunches to pull away. Holton 45, Hesston – Top-ranked Holton advanced by shutting out Hesston 45-0. The Wildcats limited Hesston running back Ryan Schadler to 107 rushing yards on 24 carries. Brenden Hampton rushed for 165 yards and two scores for Holton. Mulvane 47, Wichita Collegiate 45 – Mulvane rallied from down 45-27 early in the fourth quarter to beat Collegiate 47-45. Michael Mason scored with 2:20 left to give the Wildcats the lead. Landon Root led Collegiate down the field, but Mulvane stopped the Spartans on fourth down inside the 15-yard line. Mason rushed 40 times for 354 yards for Mulvane. Andale 60, Larned 0 – Hunter Knoblauch rushed for five first-half touchdowns as Andale routed Larned. The Indians led 46-0 at halftime and rolled to the 60-0 shutout. McPherson 47, Clay Center 7 – T.J. Stiles scored a pair of touchdowns as McPherson routed Clay Center by 40 points. Kyler Kinnamon added a touchdown run and returned a punt for a scores. Clay Center lost in the first round for the sixth consecutive season. Topeka Hayden 48, Maize South 45 – In what many expected to be a defensive struggle, Hayden outlasted Maize South 48-45 in overtime. The Mavericks scored first in overtime on a 22-yard field goal, but Hayden’s J.C. Menke scored from a yard out to propel the Wildcats to the next round. Winfield 14, Rose Hill 12 – After a lengthy weather delay postponed the start of this one until nearly 10:00 pm, the two teams struggled to get any offense going. Rose Hill finally built a 12-0 lead in the third quarter before Winfield tied it up. Winfield took a 14-12 lead into the fourth quarter after a safety caused by a bad snap proved to be the deciding points. Buhler 14, Ulysses 7 – Buhler made the long road trip to Ulysses and came away with a victory for a second consecutive season. Ian Rudzik scored first for Ulysses, but Buhler tied at halftime and took the lead on a 62-yard touchdown by Riley Allen mid-way through the third quarter. Abilene 27, Goodland 26 – Goodland scored late in the game and decided to go for the two-point conversion and the win. Abilene’s Matthew Anguiano came up with a big tackle for a loss on the conversion and the Cowboys beat the Goodland Cowboys 27-26. Hiawatha 25, Riley County 8 – Parker Hasenkamp and Brenden Steele rushed for first-half touchdowns as the Red Hawks built a 13-8 lead. Hiawatha tacked on a pair of touchdowns in the second half to advance. Silver Lake 35, St. Marys 0 – Silver Lake scored 28 points in the third quarter to pull away from the Bears. Cody Renfro rushed for two touchdowns and returned an interception for a third score in that decisive quarter. St. Marys played without Phil Johnson who had rushed for more than 1,600 yards on the season. Wellsville 32, Eureka 12 – Wellsville advanced to the second round of the playoffs for the fourth consecutive season by beating Eureka by 20. The Eagles built a 26-0 halftime lead in cruising to their eighth win of the season. St. Mary’s Colgan 30, Caney Valley 22 – Colgan took advantage of three Caney Valley turnovers in the second half to upset the fifth ranked Bullpups on the road. Leading 24-16 in the fourth quarter, Colgan’s Colton Gilbert broke a 49-yard touchdown run to essentially put the game away. Caney’s Levi Wyrick added a 38-yard score with two minutes left then a lengthly lightning delay ensued before the Panthers could kneel out the clock. Nemaha Valley 6, Sabetha 0 – Nemaha Valley beat Sabetha for the second time this season with a 6-0 shutout on Tuesday night. Devin Henry scored on a two-yard run in the third quarter to provide all the scoring. The Raiders defeated Sabetha 28-21 during the regular season. Rossville 49, Pleasant Ridge 0 – Tucker Horak rushed for more than 200 yards and six touchdowns as Rossville eased into the second round with a 49-0 blowout of the Rams. Humboldt 13, Central Heights 6 – Humboldt built a 13-6 lead at halftime and then held on for the victory by that same margin. The Cubs have won their eighth game for a second consecutive season under K.B. Criss. Cherryvale 32, Galena 18 – Cherryvale may have pulled the upset of the night by beating Galena at Abbey Field 32-18. Tristan Thornton battled the wet, muddy conditions to rush for more than 180 yards for the Chargers. Conway Springs 54, Wichita Independent 12 – Conway Springs blasted Independent for a second time this season to advance in the playoffs. The Cardinals received a big performance from Dakota Finstad who rushed for nearly 200 yards and three touchdowns. Kingman 12, Halstead 0 – The Kingman Eagles won their first playoff game since 2002 with a 12-0 shutout of Halstead. Mitchell Packard and Parker Maloney contributed scoring runs for Kingman, which defeated Halstead 28-21 back in Week 6. Phillipsburg 27, Sacred Heart 20 – Phillipsburg built a 20-point halftime lead before holding on for a 27-20 victory over Sacred Heart in Salina. Panther quarterback Riley Juenemann tossed a touchdown pass with less than ten seconds remaining in the first half to put Phillipsburg up 27-7. Scott City 43, Lakin 0 – Defending 3A champion Scott City opened their title defense with a shutout of Lakin. The Beavers built a 29-0 halftime lead in beating the Broncs. Scott City will travel to Phillipsburg on Saturday. Sedgwick 36, Douglass 14 – Sedgwick trailed Douglass 14-13 to begin the third quarter before scoring 23 points in the final quarter. The Cardinals took the lead 20-14 then immediately recovered a Bulldog fumble which set up another score. Marion 10, Hutchinson Trinity 0 – Marion won its first playoff game since 2003 with a 10-0 shutout of Heart of America League rival Hutch Trinity. The Warriors defeated the Celtics 19-10 during the regular season. Beloit 50, Southeast of Saline 7 – Beloit blasted Southeast of Saline by 43 points on Tuesday, one-point more than in the regular season matchup. The Trojans led 22-0 after the first quarter and 36-0 at halftime. Holcomb 21, Hoisington 6 -- Holcomb defeated Hoisington for the second consecutive season in the first round. The Longhorns won this matchup 21-6 after defeating the Cardinals 28-7 last season. Holcomb will host No. 1 Beloit on Saturday evening. Yates Center 38, West Elk 36 – After a long weather delay, Yates Center scored with under two minutes to go to take a 38-30 lead on unbeaten West Elk. The Patriots answered with an Armando Gomez touchdown to pull within two points. The two-point attempt was good, but was negated by penalty. A second attempt was stopped by the Wildcats and Yates Center pulled off the upset. West Elk had defeated Yates Center 52-6 back in Week 2 in a game that ended at halftime. Yates Center gets the schools’ first playoff win since 1983. Clifton-Clyde 42, Peabody-Burns 26 – Clifton-Clyde outscored Peabody-Burns 14-0 in the second half en route to a 42-26 road win. It was the first playoff appearance for the traditionally strong Eagles since 2010 and their first playoff win since 2009. Marais des Cygnes Valley 48, South Haven 18 – MdCV picked up its first playoff win since 1986 by routing South Haven 48-18. The Trojans were eliminated by the Cardinals 52-22 in the first round last season. On Tuesday, MdCV led 22-0 at the end of the first quarter on the strength of a Kaden Vanderpool punt return for a touchdown. Osborne 40, Madison 34 – After a back-and-fourth first half, Osborne took the lead for good on a Kenton Ubelaker touchdown in the third quarter. Ubelaker finished with 135 rushing yards and nearly 130 more yards receiving in the game. The hometown Bulldogs extended their lead to 34-22 after a Maverick LeRock touchdown, but Madison responded early in the fourth quarter to pull within 34-28. That’s when Osborne grinded out a long drive that resulted in another LeRock touchdown and a 40-28 lead. Madison scored again with around two minutes left, but was unable to recover the onside kick. Central Plains 36, South Central 14 – Central Plains built a 16-6 halftime lead and slowly pulled away from South Central on Tuesday night in Claflin. Braeden Crites passed for two touchdowns and rushed for another to lead the Oilers. Hodgeman County 34, Atwood-Rawlins Co. 32 – After a scoreless first quarter, Hodgeman County built a 28-6 halftime lead and extended its lead to as much as 34-12 in the second half before the Buffs rallied. Rawlins County began to chip away and eventually scored with 1:13 remaining to pull within 34-32. The Buffaloes were stopped on the two-point conversion attempt that would have tied the game. Kiowa County 50, Solomon 14 – Kiowa County used the same formula they’ve employed all season to a 50-14 rout of Solomon. Trever Powell rushed 36 times for 352 yards and six touchdowns to lead the Mavericks past the Gorillas. Solomon ended Kiowa County’s season in the first round a year ago with a 54-42 win. Hoxie 44, Spearville 36 – Hoxie and Spearville played a competitive contest on Tuesday night with the fifth-ranked Indians prevailing 44-36. Hoxie led 20-16 at halftime, but trailed the Royal Lancers 30-28 at the end of the third quarter. Conner Katt rushed for nearly 220 yards and three touchdowns to lead the Indians. Baileyville B&B 50, Southern Cloud 0 – Quarterback Dustin Rottinghaus rushed for three touchdowns as B&B rolled to a 50-point win over the Warriors. Neil Sudbeck led the Falcons with 150 yards on the ground and a pair of touchdowns. Waverly 24, Stafford 20 – Waverly broke a string of five consecutive first-round playoff losses with a narrow win over Stafford. Senior Austin Bailey rushed for 160 yards and two scores for the Bulldogs in the win. Derek McClure passed for more than 200 yards and three scores for the Trojans in defeat. Hanover 52, Hope 0 – Hanover blanked Hope 52-0 in a game called at the half. Preston Jueneman scored three touchdowns for the Wildcats as they burst out to a 38-0 lead in the first quarter. It was the last game for the Hope Lions which will combine with White City to form Rural Vista next season. South Barber 60, Chetopa 34 – South Barber won the battle of the two top offenses with a 60-34 win over visiting Chetopa. The Chieftains built a 26-12 lead after one quarter only to see Chetopa tie the game at halftime. The Green Hornets remained within reach trailing just 40-26 entering the fourth quarter, but South Barber scored 20 points in the final period to pull away. Beloit St. John’s-Tipton 48, Weskan 0 – St. John’s-Tipton blasted Weskan behind a big night from senior Connor Eilert. Eilert rushed for 90 yards and four touchdowns to lead the Blujays. Garrett Mishler also chipped in 90 yards and two scores. Victoria 50, Ingalls 0 – Bryan Dome scored Victoria’s first three touchdowns as the Knights built a 22-0 lead en route to a 50-0 shutout of Ingalls. Quarterback Brady Dinkel threw three touchdown passes and intercepted three passes on defense. Sharon Springs-Wallace Co. 53, Thunder Ridge 6 – Wallace County turned what was anticipated to be a good game into a blowout with a 47-point win over the west’s state title participant from each of the past two seasons. Kyle Gfeller passed for 160 yards and two touchdowns and rushed for 120 more yards and two scores. 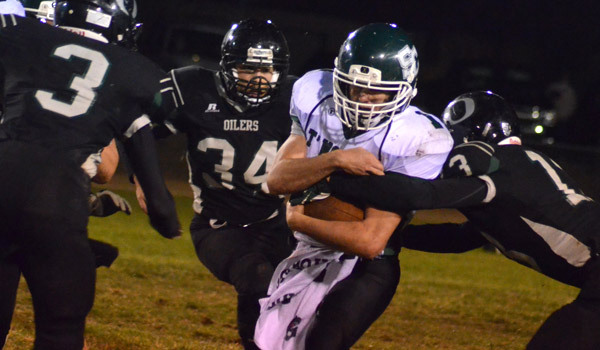 Dighton 54, Fowler 6 – Dighton improved to 6-4 with an impressive 54-6 win over Fowler. The Hornets raced out to a 24-0 lead early in the game and extended it to 32-8 by the intermission. Dighton added 22 points in the second half to secure the win.